Smith with a piece from his series "Family Portraits." Alim Smith paints in a style he calls afro-surrealism. The 28-year-old Wilmington native went viral last year for his renditions of popular memes. 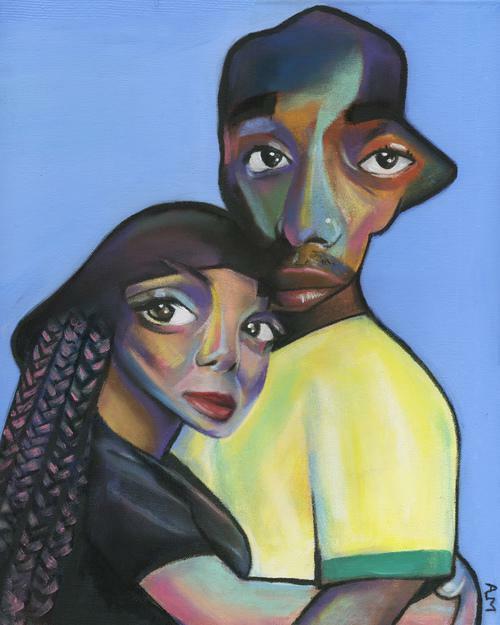 He’s also painted the likes of Snoop Dogg and Erykah Badu— what he says Black History Month might look like from a millennial’s perspective. He says he’s moving away from portraiture now, and toward visual folklore. Smith’s only formal training was at Cab Calloway School of the Arts in Wilmington. He says his signature style is inspired by the work of M.C. Escher. “He is my absolute favorite artist. ‘Cause I feel like he is the perfect mix of creativity and skill. And that’s what I’m aiming for. Mostly M.C. Escher and Dali. I just love how they twisted reality,” he said. “Because growing up in art school I didn’t really like art that much, like the art that they showed us. Because it was very— bleh. It’s just a picture. The internet has played a pivotal role in Smith’s career as an artist. He says he’s able to support himself financially by selling prints online and doing commissions. 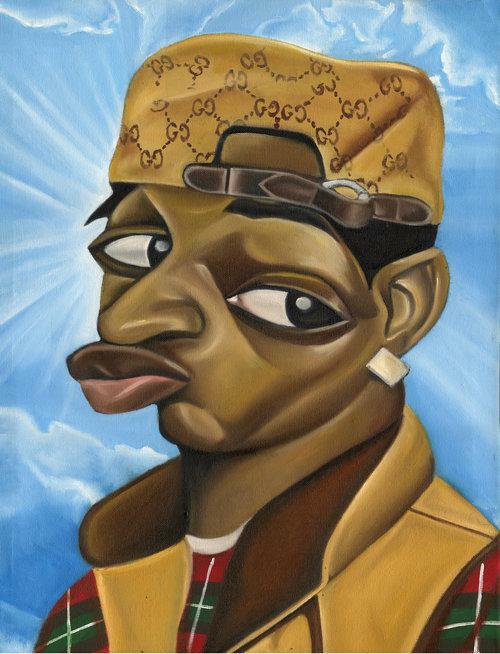 Conceited, 18 x 24, oil on canvas. From series "Memes." Much of his success started last year, when his meme series went viral. He was interviewed in several national news outlets, including Time. Smith says he feels his quick rise in recognition affected the quality of his art. Poetic Justice, 16 x 20, pastel on canvas. From series "In Living Color: My Black History." Smith appreciates how the internet has allowed him to be independent as an artist — not dependant on the traditional centers of power in the industry, like the gallery scene. But he says the internet has its downsides. “The internet I feel like has really washed down and watered down art. And a lot of people are in a rush to upload things just to be like ‘I’m creating, I’m creating, I’m creating.’” said Smith. He says the intense and ubiquitous nature of the internet inspires the surrealism in his work. “There are no stories for the African-American experience. Like folklore-type stories. That doesn’t exist,” he said. 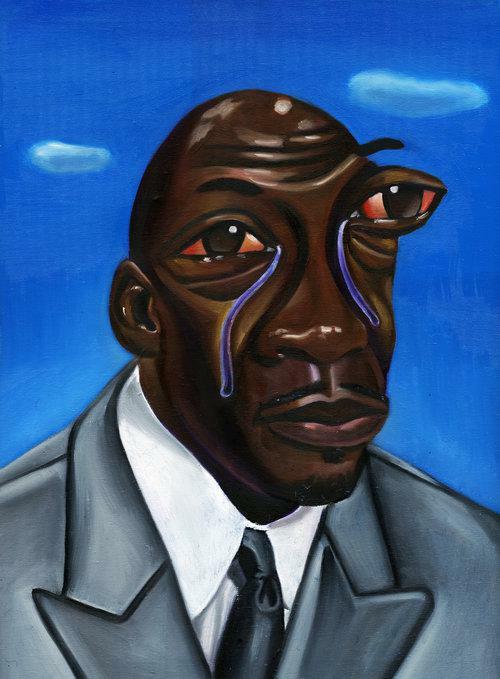 Crying Jordan, 18 x 24, oil on canvas. From series "Memes." Smith says one painting in this story draws on imagery from his youth in Wilmington. Smith currently splits his time among Wilmington, Philadelphia and Newark, N.J. But he says his hometown has helped his creative process. But he says there’s a downside to Wilmington’s slower pace as well. “When I think of like a rat or a mouse in a maze, Wilmington feels like a great place for the maze. But there’s no cheese,” said Smith. Smith says he plans to explore this theme in a future series. Smith’s art can be found online under the name YESTERDAYNITE.